This is a method for learning to play a piece of music from memory that I have used occasionally. First choose a piece of music that you have been practising and know how to play from the music, this way you can ensure that you already have some of the groundwork of technique required. This will also make it easier to recall the sound in your head. Take the sheet music away from the piano and read through it, at the same time imagining you are playing it. Really try to imagine the feel of the keys under your fingers and the movements of the correct fingers, as well as the sound. As you are reading the music and imagining the corresponding sounds and finger patterns, try and be aware of the names of the notes and harmonies. Having a named sequence of notes or chords in your memory can help when you come to play the music. 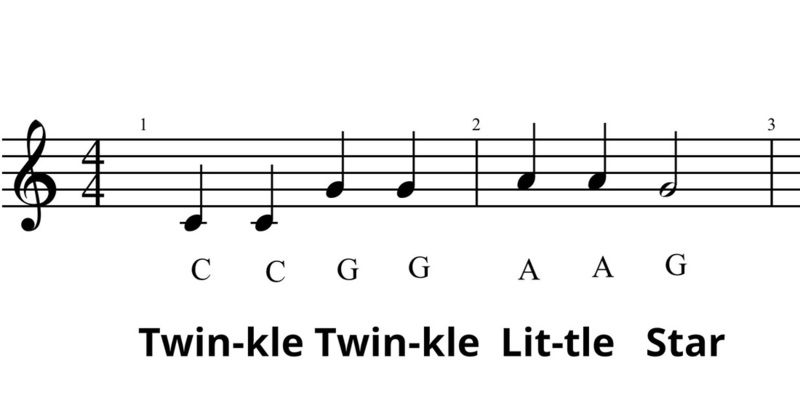 Here is a very simple example of this method, using the well known tune "Twinkle Twinkle Little Star". Whilst reading the notes shown in the picture above, imagine the tune, maybe even sing "Twinkle Twinkle Little Star" in your head. Also visualise where the notes " C C G G A A G" are on the piano; imagine the keys under your fingers and which fingers you would use to play them; say the note sequence "C C G G A A G" to yourself until you know it by heart. Then, once you have spent some time reading the music and imagining playing it away from the piano, try playing it on the piano without the music. This is just a simple example, but I have used this method for memorising more complex pieces of music. I have found it to be very helpful for getting past sticking points, and for reinforcing other aspects of memory, such as muscle memory. The visualisation process strengthens the conscious awareness of notes, harmonies, rhythms, sounds and structure which can be a real advantage if you find yourself getting lost when playing a memorised piece of music on autopilot. This method is also useful for studying the performance directions. I have used this method as a stand alone method of memorisation, but it can also be very useful as just a reinforcement of the learning process if you don't wish to play the music from memory.